Open lines of communication help prevent confusion, and defined expectations facilitate open lines of communication. Defining who is responsible for collecting what information and how that information will be communicated can prevent bottlenecks before they occur. 1.) How will information be gathered and shared? The following items may come from you, the creditor, the borrower, the borrower’s real estate agent, the seller, the seller’s real estate agent, or others. Determine who is responsible and how the information will be shared. Condominium, homeowner’s association or similar required costs related to the property. This includes any arrearages owed by the current owner as well as transactional costs, and monthly or annual obligations of the property owner. 2.) What does the creditor expect from you? Coordination with creditors so that they have complete, detailed information for timely disclosures on mortgage borrowers’ Loan Estimates will enhance compliance as well as the experience for those mortgage borrowers. a. Your title fees, both required and optional. 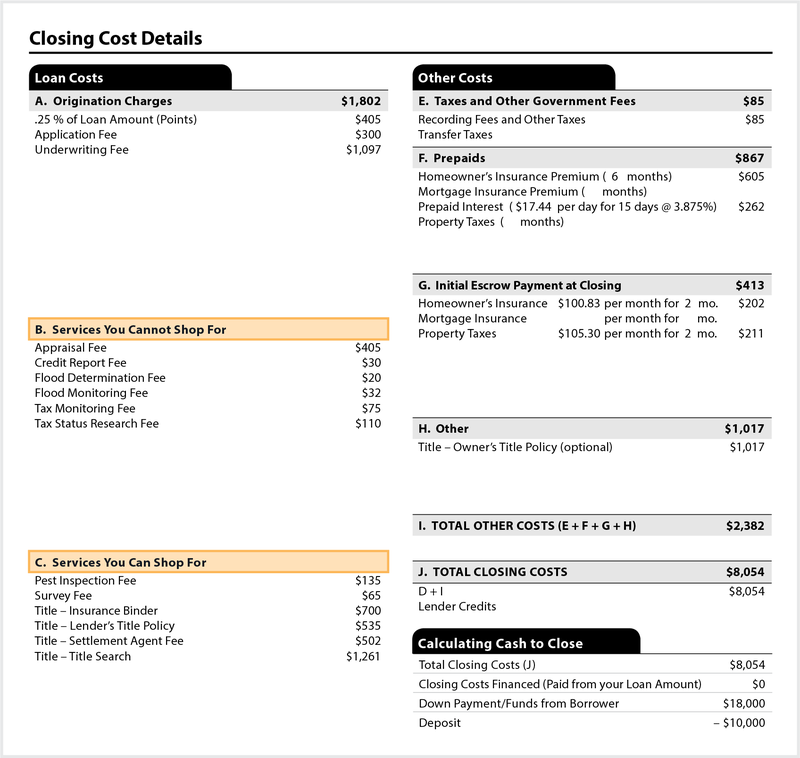 Title insurance fees that are required by the creditor may be shown under Loan Costs on page 2 of both the Loan Estimate and Closing Disclosure in either section B. Services You Cannot Shop For, or under Section C. Services You Can Shop For. The appropriate category depends upon whether the creditor permits the borrower to shop. A creditor permits a borrower to shop for a settlement service if the creditor permits the borrower to select the provider of that service, subject to reasonable requirements. §1026.19(e)(1)(vi)(A). A creditor is permitted to impose reasonable requirements regarding the qualifications of the settlement services provider. For example, the creditor may require that a settlement agent chosen by the borrower must be appropriately licensed in the relevant jurisdiction. However, a creditor cannot characterize fees listed on page 2 of the Loan Estimate as Services You Can Shop For if that creditor requires the borrower to choose a provider from the list provided by the creditor. Comment 1026.19(e)(1)(vi)-1. If the creditor permits the borrower to shop for a settlement service, the creditor must provide the borrower with a written list identifying at least one available provider of that service and stating that the consumer may choose a different provider for that service. §1026.19(e)(1)(vi)(C). The creditor is responsible for disclosing good faith estimates of all title-related fees on the Loan Estimate. Inaccurate disclosure of title-related fees may require the creditor to reimburse the borrower for additional charges added later in order to comply with the Know Before You Owe rule. §1026.19(f)(2)(v). If the creditor did not allow the consumer to shop for a settlement service, the creditor may need to reimburse the borrower for any additional charges for that service that are added later in order to comply with the Know Before You owe rule. If the creditor did allow the consumer to shop for a settlement service and you were on the creditor’s Written List of Providers, the creditor may need to reimburse the borrower for any of your additional charges added later, in order to comply with the Know Before You owe rule. If the creditor did allow the consumer to shop for a particular settlement service that you provide, and the consumer selected your company and you were not on the creditor’s Written List of Providers, and the consumer selected you, then the creditor is unlikely to need to reimburse the consumer for any differences between the fees disclosed on the Loan Estimate for that settlement service and the fees disclosed later charged on the Closing Disclosure. 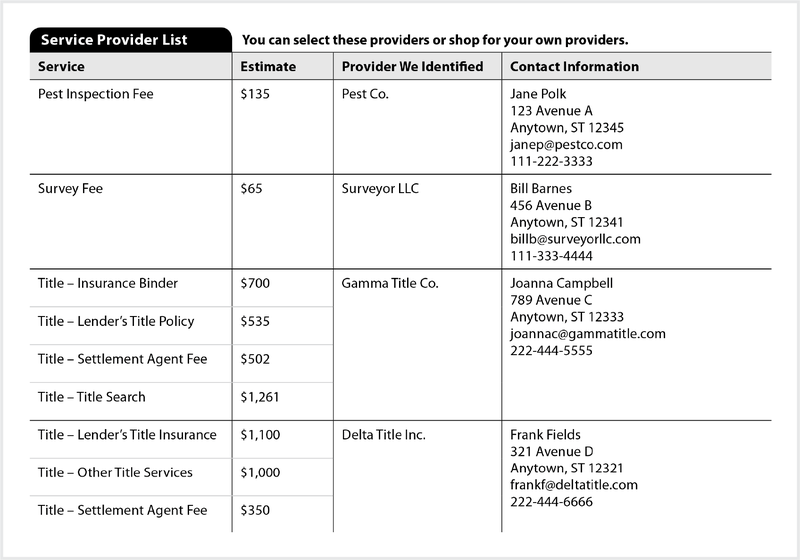 This is a sample of the Written List of Providers that may be provided by a creditor. The list is permitted to, but does not have to, include an estimate of fees. b. Your settlement File # for the transaction. The File # at the top of page one of the Closing Disclosure on the left-hand side under Closing Information is always your information. The file number required by § 1026.38(a)(3)(v) may contain any alpha-numeric characters and need not be limited to numbers. Under §1026.38(a)(3)(iv), Settlement Agent refers to the entity that employs the individual conducting the closing. The name of the individual conducting the closing is not required. Section 1026.38(a)(3)(iv) requires the name of the entity that employs the settlement agent. The name of the individual conducting the closing is not required. 3.) In a purchase transaction, will the Buyer’s and Seller’s Closing Disclosure be separate or combined? Section 1026.38(t)(5)(v) permits the creditor to separate the disclosure of buyer and seller information, and § 1026.38(t)(5)(vi) permits the use of a modified version of the Closing Disclosure for a seller. Coordinate with the creditor to establish whether the disclosures will be separate or combined. Keep in mind that some information must be provided to both the buyer and the seller. Real estate commissions, for example, must be shown on Page 2 of the Closing Disclosure (see § 1026.38(g)(4)) and disclosed on both the buyer’s and the seller’s Closing Disclosures. 38(t)(5)(v) Separation of consumer and seller information. A. The information required to be disclosed by paragraphs (j) and (k) of this section may be disclosed on separate pages to the consumer and the seller, respectively, with the information required by the other paragraph left blank. The information disclosed to the consumer pursuant to paragraph (j) of this section must be disclosed on the same page as the information required by paragraph (i) of this section. B. The information required to be disclosed by paragraphs (f) and (g) of this section with respect to costs paid by the consumer may be left blank on the disclosure provided to the seller. C. The information required by paragraphs (a)(2), (a)(4)(iii), (a)(5), (b) through (d), (i), (l) through (p), (r) with respect to the creditor and mortgage broker, and (s)(2) of this section may be left blank on the disclosure provided to the seller. 38(t)(5)(vi) Modified version of the form for a seller or third-party. The information required by paragraphs (a)(2), (a)(4)(iii), (a)(5), (b) through (d), (f), and (g) with respect to costs paid by the consumer, (i), (j), (l) through (p), (q)(1), and (r) with respect to the creditor and mortgage broker, and (s) of this section may be deleted from the form provided to the seller or a third-party, as illustrated by form H–25(I) of appendix H to this part.